Also in attendance were singers Lil Mama and LeToya Luckett, as well as the stars of The Real – Tamera Mowry, Adrienne Bailon, Loni Love, and Jeannie Mai – who won the award for Outstanding Talk Series. 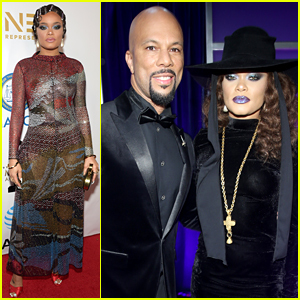 The four co-hosts also hosted the non-televised awards ceremony on Sunday night. This Is Us stars Sterling K. Brown, Mandy Moore, and Susan Kelechi Watson walk the red carpet at the 2018 NAACP Image Awards at the Pasadena Civic Auditorium on Monday (January 15) in Pasadena, Calif. The show was nominated for Outstanding Drama Series and both Sterling and Susan had acting nods, but sadly none of them won. Anthony Anderson hosted the event and picked up an acting award for black-ish. Also in attendance were his co-star Laurence Fishburne, The Chi‘s Tiffany Boone, White Famous‘ Jay Pharoah, Detroit‘s Algee Smith, Terry Crews, Keegan-Michael Key, and Sterling‘s wife Ryan Michelle Bathe. FYI: Sterling is wearing an Isaia tuxedo, Jimmy Choo shoes, and a Chopard watch and cufflinks. Mandy is wearing a Vika Gazinskaya dress and Graziela Gems jewelry. Susan is wearing a Phuong My dress, a Loriblu clutch, and Maxior jewelry. Tiffany is wearing a PHUONG MY dress, Lena Erziak shoes, a Devi Kroell bag, Noudar earrings, and a Le Vian ring. Filmmaker Ava DuVernay Wins Entertainer of the Year at NAACP Image Awards 2018! Ava DuVernay poses with her trophy in the press room at the 2018 NAACP Image Awards at the Pasadena Civic Auditorium on Monday (January 15) in Pasadena, Calif. The A Wrinkle in Time director was awarded the Entertainer of the Year prize, which was presented to her by Mudbound actress and singer Mary J. Blige. In the past year, Ava was nominated for an Oscar for directing the documentary 13th, she directed the upcoming A Wrinkle in Time, she directed the music video for Jay-Z and Beyonce‘s “Family Feud,” and she released another season of her series Queen Sugar. Ava beat out Bruno Mars, Chadwick Boseman, Chance the Rapper, Issa Rae, and Jay-Z for the honor. Check out the complete winners list now! FYI: Ava is wearing a Greta Constantine jumpsuit and Malone Souliers heels. Mary is wearing a Christian Siriano dress. 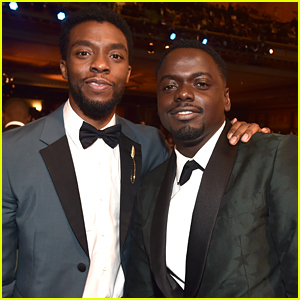 Black Panther's Chadwick Boseman & Daniel Kaluuya Meet Up at NAACP Image Awards 2018! Chadwick Boseman and Daniel Kaluuya pair up at the 2018 NAACP Image Awards at the Pasadena Civic Auditorium on Monday (January 15) in Pasadena, Calif. The guys star in the upcoming movie Black Panther and they were joined at the event by co-stars Michael B. Jordan and Danai Gurira. Also in attendance were Chadwick‘s Marshall co-star Josh Gad and Daniel‘s Get Out co-stars Betty Gabriel and Lil Rel Howery, as well as writer-director Jordan Peele. Daniel won the award for Outstanding Actor in a Motion Picture for his work in Get Out while Jordan won for both writing and directing the film. FYI: Chadwick is wearing a Prada tuxedo, Christian Louboutin dress shoes, and a Jason of Beverly Hills lapel pin. Daniel is wearing a Ports 1961 tuxedo and a David Yurman bracelet and ring. Michael is wearing Christian Louboutin shoes. Danai is wearing a Rodarte bustier and skirt. Josh is wearing a Chopard timepiece, Tacori cufflinks and a cuff. 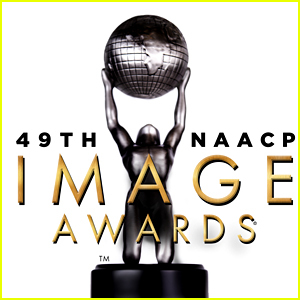 NAACP Image Awards 2018 - Complete Winners List! The full list of winners from the 2018 NAACP Image Awards has been announced and the event honored a wide variety of entertainers! black-ish won big in the television comedy categories while Power was a big winner in the television drama categories. Girls Trip was also a big winner with awards for Best Motion Picture and also an acting win for Tiffany Haddish. 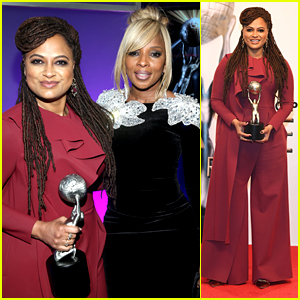 Ava DuVernay, the director of the upcoming movie A Wrinkle in Time, was honored with the Entertainer of the Year award. Make sure to check out the full list of winners! Yara Shahidi & Storm Reid Join Young Hollywood Stars at NAACP Image Awards 2018! Yara Shahidi and Storm Reid look so chic on the red carpet at the 2018 NAACP Image Awards at the Pasadena Civic Auditorium on Monday (January 15) in Pasadena, Calif. The young stars were joined at the event by Yara‘s black-ish co-stars Marsai Martin, Marcus Scribner, and Miles Brown. Marsai won the award for Outstanding Supporting Actress in a Comedy Series and Caleb won Outstanding Performance by a Youth. FYI: Yara is wearing a Vera Wang dress, Jimmy Choo shoes, Aurate earrings, and a Kat Kim ring. Storm is wearing a Yanina Couture dress and Jimmy Choo shoes. Jasmine is wearing an Ester Abner dress, Giuseppe Zanotti shoes, and Bulgari jewelry. Logan is wearing a Maria Lucia Hohan dress and Neil Lane jewelry. Marsai is wearing a custom Pantora Mini dress, Andrea Groussman jewelry, and Loriblu shoes.